Installation View, Matthew Craven, MONUMENTS, David Shelton Gallery. 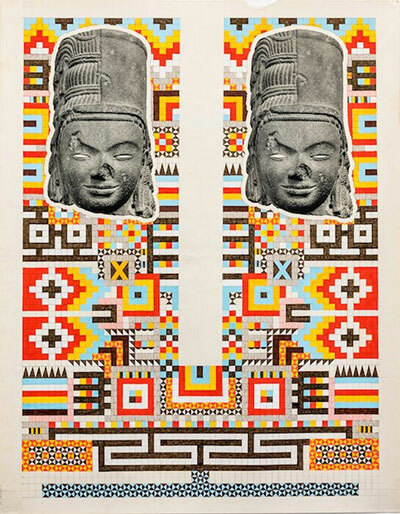 Matthew Craven; DDoubles, 2015; found image and ink on found paper; 28 x 22 in. Matthew Craven’s collage/drawings, on view at David Shelton Gallery in Houston through Feb. 6, are about making new contexts for things. 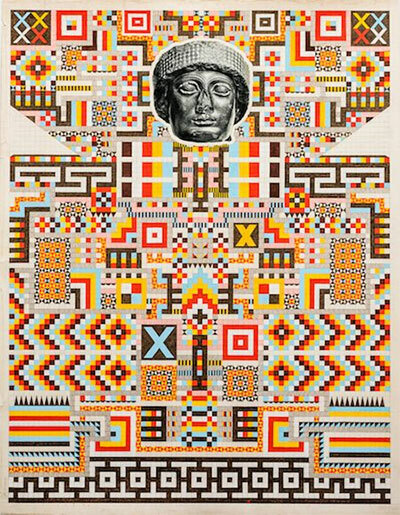 In them, he pastes images of ancient artifacts over intricately patterned marker drawings made on the backs of vintage movie posters. It’s a densely-layered compilation, with much to say about how we historicize images based upon their cultural origins and our cultural assumptions. Craven constructs the bright and complex geometries of his drawings over a pencilled-in grid. A child of the 80s, Craven’s context (and mine) is informed by a particular technologically-inflected kind of childhood diversion that kept us entertained (and/or organized) in the moments before the household computer became widely available: Crayola markers, Trapper Keepers, the Etch-a-Sketch, the Spirograph. Looking closely at the texture of the drawings, you can see the unevenness inherent to marker, you can see the edges of the grid underneath. These send me back to long childhood afternoons spent with nothing but my own boredom and a box of beaten-up art supplies. Now, look closely at the works. The patina of the movie posters is visible in the paper’s rough edges, in small stains that seep through the surface, in tape marks. The paper itself has a past life, and this patina underscores Craven’s historical proposition. Among other things, movies are a way of making collective fantasy, of exploring the popular unconscious, and of constructing alternative visions of the past and the future. They are the screens we looked at to distract ourselves before we got personal computers and smart phones. Craven turns the movie image to the wall, using its blank backside for his compositions. Instead of the movie, we are shown the ambiguous past of the paper itself. Look not at the thing you expect to find; rather, look at how its representation is used, stains and tears and all. found image and ink on found paper; 40 x 31 in. 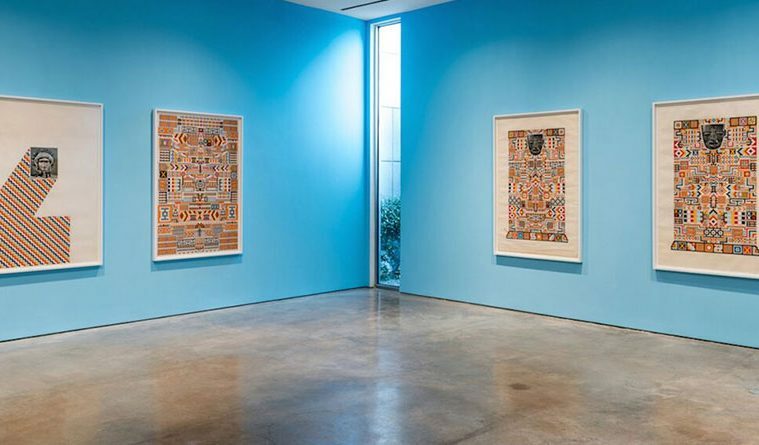 On many of the drawings, Craven has pasted images of artifacts—in this exhibition, he makes use of ancient sculptural heads from a panoply of cultures and time periods. He collects them from discarded textbooks (which are increasingly being replaced by screen-based substitutes). 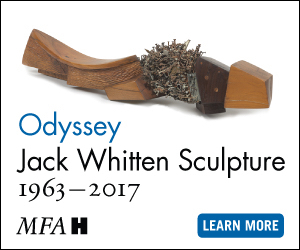 In Craven’s compositions, the sculptures lose their cultural specificity and become something more like mysterious totems, what Craven calls “universal” objects. To splice cultural referents together, out of context, is complicated, fraught with appropriationist fantasies. Context matters. Cultural specificity matters. Objects indicate important truths about the world that creates them. But Craven’s decontextualization is also a delicious, intoxicating remix. I feel torn between these extremes. If we look at the collages seriously as pastiche, we have to reconsider how we make meaning from historical objects, here and now. Maybe what those textbooks said about the objects is being replaced by new scholarship, new ways of looking, new histories. Layering these Assyrian, Egyptian, Mexican, and Chinese patterns and sculptures yields a familiar vision for a generation of kids raised in the years of the Challenger, of Sesame Street, of believing that we could all be president and that embracing diversity was a way of engaging certain bigger truths. And, at the same time, in its insistently hand-made, patinated surface, Craven’s images themselves emerge out of a recent historical moment, an analog moment, for which we seem to be feeling increasingly nostalgic. 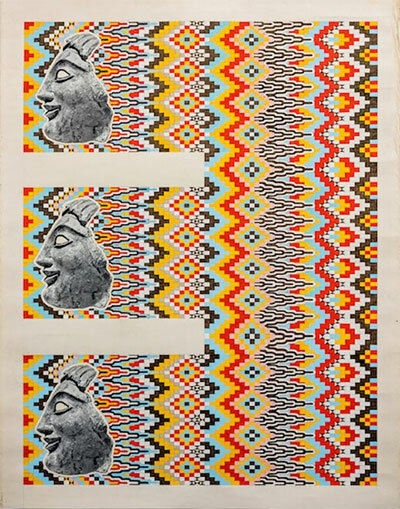 Matthew Craven; Triiiplets, 2015; found image and ink on found paper 51 x 40 in. The works in MONUMENTS are graphically delightful, but they are not simple. Their optimism lies in the cultural remix, the compilation that demands new ways of making histories from our shared—and infinitely complex—contexts. If anything, we should be careful with them, not to assume that they are without complicated legacies. To change the context of something is not to remove meaning from it, but to open up the possibilities of what else it might mean, in an unexpected conversation. After all, we make monuments to remind ourselves of important truths… and then we tear them down.